Cotton field ripe for picking. After discovering the tire man, there was daylight left to burn so I headed east on Arkansas Hwy 1. 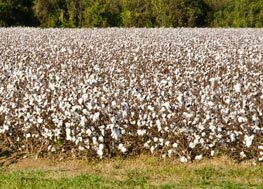 In a few miles, I encountered a cotton field, ” … ripe unto harvest. 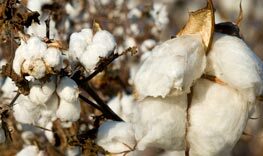 “Recalling that more than a few readers, not privy to southern agriculture, enjoyed seeing soybeans up close and personal a couple of weeks ago, I did some cotton shots. It’s old hat to those of us in these parts. Cotton in the field, up close and personal. To those not so familiar, take a look at your new sheets or shirt in the rough. After cotton is picked it goes to a gin which essentially spits seed and trash out one side and bales of cotton out the other, thanks to ol’ Eli Whitney. He first filed his patent for what is now known as the cotton gin in 1794. Time flies when you are having fun. But it was not as much fun for Whitney as one might think, of an inventor who presented the world with what is known as one of the most important developments of “the industrial age.” His machine was relatively simple and easy to pirate. And so it was. He complained to Congress and they more or less ignored him. Life goes on. Cotton gin fallen to disuse. The rust is slowly winning. Years ago, as late as the early and mid sixties, there were a plethora of gins in cotton country. As transportation and gin technology advanced, newer larger, more centrally located gins began to corner the market. Now one sees a lot of older gins no longer in use. They have become case studies in ferrous oxide (rust to the non-chemically oriented). Before electricity saturated rural areas, many gins operated on power from internal combustion engines. One clever operator in our area was reported to have powered his gin with a WWII war-surplus tank engine. Historical marker at Watson AR. Back on the road, I pulled into a small Delta town with rich historical roots, Watson AR. 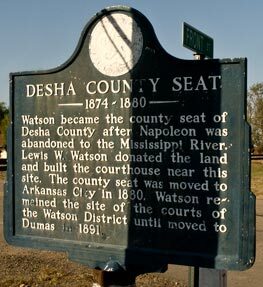 Prior to 1874, the nearby town of Napoleon was the county seat of Desha (Dee-shay) County. Unfortunately, the rampaging Mississippi River gobbled up Napoleon, and the county was not ready for, nor equipped to operate with an underwater county seat. So the county seat was moved to Watson. But just for a few years. Now the county seat is at Arkansas City to the south of Watson. Arkansas City had it’s brush with the Mississippi River as well. Once a vibrant, bustling, river port town on the Mississippi, it was left 13 miles inland from the river after the infamous 1927 flood. With no commerce, the town dwindled, but is alive and well today. What remains of Watson today is a nice, southern town. 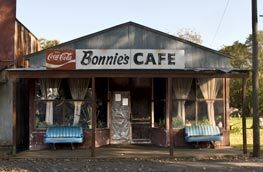 I found Bonnie’s Cafe in Watson. 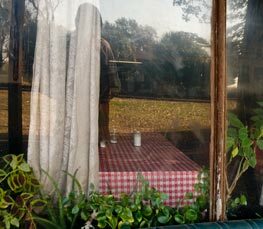 I took a peek in the window and determined that Bonnie’s Cafe is alive and well, but closed on Sunday afternoon. The “open” sign was laying on one of the tables in readiness for welcoming Monday’s customers. Though I could not enter the cafe, I could see the checkered table cloths on a cluster of tables. The back wall decor is a collection of old tools. Live, not plastic, plants adorn the windows. Me, peeking in Bonnie's front window. A couple of recycled van seats on the front porch provide creature comfort for lingering customers, or more likely, those waiting to be seated inside. If my guess is right, Bonnie’s does a good business from a phalanx of loyal and grateful customers. I’ll also bet the kitchen has more than one well-seasoned cast iron skillet. Shopping centers and mega stores may lure retail customers away from small towns, but these corporate giants cannot under any known circumstances stand toe-to-toe with a good down home southern country cafe. I intend to verify my suspicions of Bonnie’s culinary prowess, armed with a well-honed case of the galloping hungritis. I’ll report back. If you’ve arrived here from the Corndancer dot com Photo of the Week, this continues the saga. If you’ve arrived here independently of the original story, and your curiosity is piqued, you can check it out here. 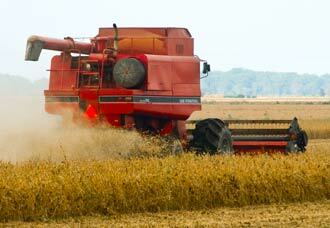 Eight row combine harvesting soybeans north of Gillette, Arkansas. John Cover's college senior nephew is at the wheel. John Cover had every right to be more than curious about the unknown pickup parked near his field and the stranger with a camera who was photographing his nephew operating a combine, harvesting soy beans in the field. I explained that I was gathering information for a weekly picture-story internet column, and that I had high hopes of finding someone cutting beans. Once he was satisfied, his gentlemanly demeanor and well-honed conversational skills quickly became evident. John Cover hitches a ride on the way to pull his mired 18 wheeler to dry ground. He is riding on the back of Scott Place's fully functional, restored '49 International Harvester KB5 Super dooly bob truck. John showed up at the field driving an 18 wheeler consisting of a tandem axle Mack truck and an empty grain trailer. While trying to negotiate the tight turn from a hard surface highway to a turn-row next to the field, the right drive wheels of the tractor became mired in a mud hole. This sort of thing is to be expected and happens in the best of families. During our conversation, John whipped out his cell phone, called Scott Place, a relative, and asked Scott to come to his rescue. Scott arrived shortly in a well restored, fully operational 1949 International Harvester KB 5 Super dooly bob truck, a vehicle you just don’t see every day. 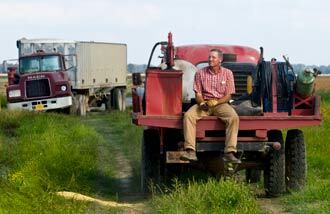 The truck was well equipped as a quintessential farm operation support vehicle. Its trappings included a visible cutting torch setup, fuel tank, oil tank and welder. No doubt the tool boxes contain a plethora of tools, chains, cables and every other imaginable device one might require to keep the wheels of agricultural progress turning. The "binder" makes short work of pulling the Mack out of the mud hole. 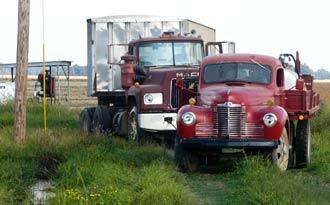 "Binder" is a nickname, perhaps even a term of endearment, for International Harvester trucks. The term has fallen into disuse since the International Harvester company was restructured. This was not John and Scott’s first rodeo when it came to pulling a stuck truck from a mud hole. Without a lot of conversation, knowing exactly what needed to be done, they hooked the tow chain in just the right places on both trucks. Seconds later, the deed was done and the Mack was on dry land. The big Mack proceeded down the turn row to receive recently harvested beans from engorged combines. The Producers Rice Mill Dixie Dryer. It's huge. At the turn row, the trucks are filled with beans. From here, they will probably to go storage and subsequently to a dryer similar to the Producers Rice Mill Dixie Dryer you see to the left. To give you an idea of the size of this giant facility, take a look a look at the small black dot at the bottom of the orange structure in the center of the picture. That dot is the door to the weigh house. Compare the height of the door to the tallest point of the building. It’s not a stretch to say it’s more than 12 stories tall. Agriculture in this neck of the woods is big. Products are shipped to the world from here. Moisture content is a big deal with beans. Growers are generally penalized if their beans have too much moisture. After all, water weighs in at 8.34 pounds per gallon. Bean buyers are much more interested in buying beans than water. So you add moisture content to the “when to cut equation.” Cut too soon and the moisture content is too high. Wait too long and a big rain comes which keeps you out of the fields. Soy beans. Left, on the vine ready to harvest; right, fresh from the combine, ready for the next steps in a long trip. Presuming that not all readers have easy access to soy beans, it is my bounden duty to elucidate those not so privileged. To the left you see a handy soy bean composite. On the left side of the picture, you see some soy beans ready to harvest. To the right, you see what comes out of the combine. 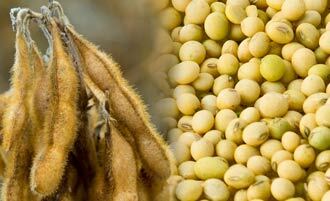 Hundreds of products contain soy beans or compounds extracted from soy beans. All of our homes benefit from this tiny legume, thanks to the likes of John Cover, his family and thousands just like them. Thanks folks. This old barn and house was under one roof. Not a bad idea in days gone by. What it missed in pleasant aromas, it made up in security, one would surmise. Imagine rounding a curve on a remote gravel road and all of a sudden before your eyes is the skeletal remains of a homesteader place. Of all the places I have found in my wanderings, this is the most primitive. I’d hazard a guess that it dates back to early 1800s, though I have no evidence other than personal opinion on the matter. It is obviously a combination barn and residence. Past that, my humble opinions follow in this story. Looking at the barn-home from the back. The residence is on the right. Enclosed and pen space for the family critters is on the left. 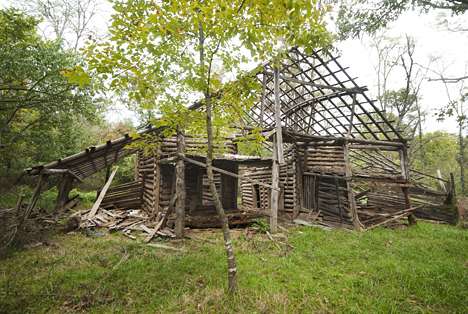 We do not know who the residents of the barn-home were. I could have probably done a bit of local research in nearby Scotland, Arkansas, and someone might have known who lived there. However, it was Saturday afternoon and there were few signs of life in the town. The store was closed and it was likely that everyone else was glued to their tv sets watching Florida administer a good shellacking to the Razorbacks. Not a good time to interrupt fans with an unsolicited request for a local history update. 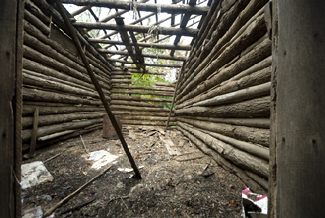 The structure shows evidence of maintenance and improvements after the original construction. The framing around the front door shows sawmill rip marks. The frame was attached with more modern looking nails. 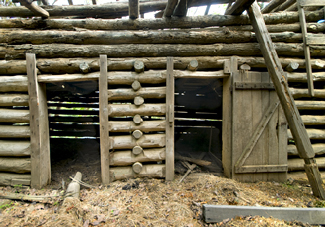 The doors on the critter side are similarly festooned with commercially prepared strips of lumber. Even the hardiest of souls can appreciate labor saving improvements. The front door to the residence appears to have been built for midgets. People of average height must stoop to enter the premises. 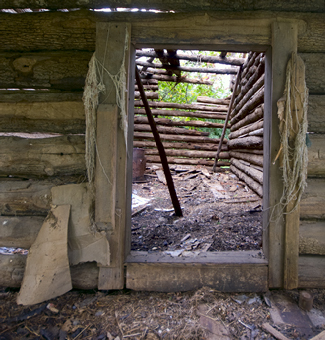 This is not uncommon for primitive residences. 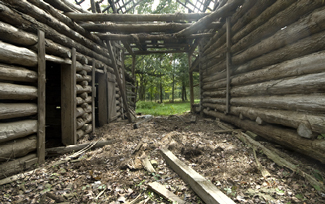 The living quarters had little to offer besides shelter and protection from predators. In that day and time perhaps that met expectations. Once you are inside the living room, den, bedroom, kitchen, closet, utility-room combination, you run out of amenities. Four walls, a ceiling, a floor and a door are it. There might have been a window at the back, but it’s hard to tell for sure. You are nicely sheltered from the elements and there is a wall between you and those critters who consider you a menu item. Past that, there’s not much more to be said for the accommodations. For these folks, a trip to town was a daylight to dark experience at the very best. Even by today’s standards, the home place is way back in the boondocks. The gravel road from highway 95 is good and well maintained now. It was probably little more than a primitive trail when this place was built. If you were a husband, and you went to town by yourself, you were leaving your family to the elements and wild critters for an entire day. Who knows, maybe more. If you were the wife left behind, as soon as husband was out of sight, the concerns mounted. What will befall him on the trip? Will I ever see him again? Critter closets. Your nearest neighbors were your animals. Right across the breezeway. Hope the breeze was in the right direction. If you both went, you had to be concerned about what might happen while you were gone. Would your home be plundered by a bear. Would a wandering miscreant knowing that if no one were home, it was likely no one would be home for a while. Long enough to do nefarious deeds. Today, we complain of modern stresses. (Most of which are self-imposed in one way or another). In 18-whatever, in this neck of the woods, one of your stressful worries was being eaten. We should count our blessings. We don’t need old-fashioned stress. Losing the remote is far preferable to being today’s special for a hungry critter. 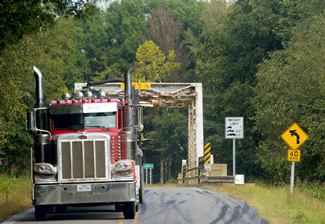 This backroad is a handy shortcut for 18-wheelers, an advantage to photographers who need to make a bridge photo interesting. This trip started at Petit Jean State Park and meandered easterly through central Arkansas. On the way, I encountered a steel bridge across Cadron Creek east of Springfield AR. Since there ain’t many of ’em left, I’m including a shot of the bridge. The telephoto lens effect gives the appearance of an imminent run over by the 18-wheeler. Not a chance. Thank goodness for long optics. All photos and content ©2008 Joe Dempsey.